Not only do I love to cook with lemons (like my Lemon Roasted Potatoes, Blueberry Lemonade Cocktail, or Cayenne Lemonade) I always keep a bag of lemons in the house for other household uses. 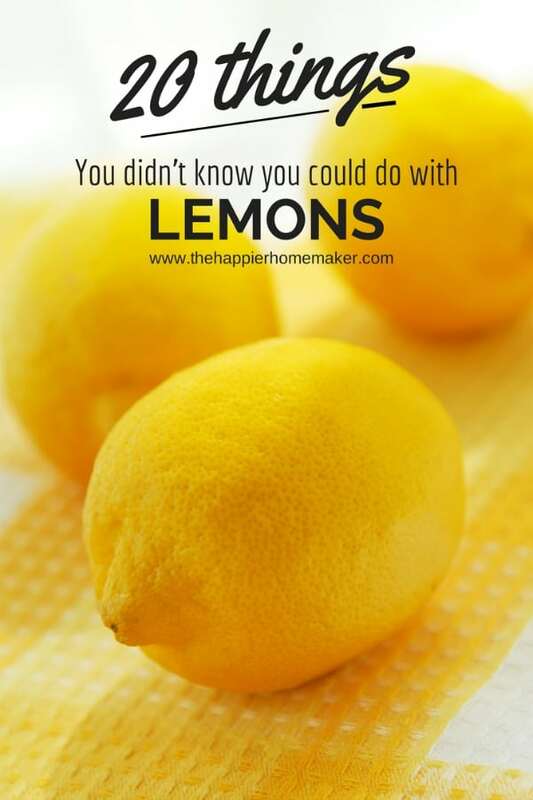 Here are 20 of my favorite things you might not know you can use lemons for! 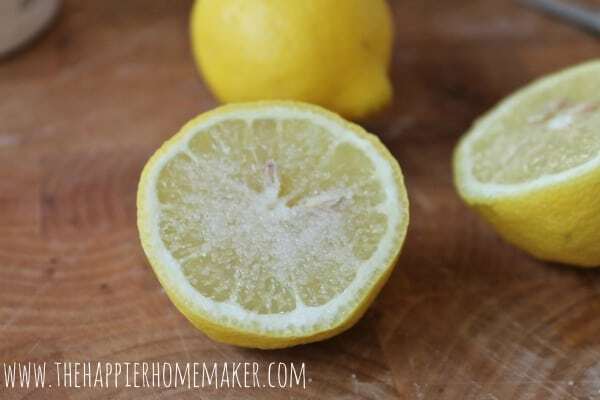 I use lemons to help scrub and deodorize my kitchen sink-get the full step by step tutorial here. Cut a lemon in half and squeeze juice into a microwaveable bowl half filled with water. Add rinds to bowl and microwave for 4 minutes. Wipe down the interior of the microwave with a cloth or sponge! Gargle with fresh lemon juice to combat bad breath! The easiest way to clean cheese graters is by simply running a cut lemon over the surface-the lemon juice cleans the fat from the garter with ease. Throw a few lemon rinds into the trashcan every so often to keep it smelling fresh. My nails get stained from time to time by my nail polish-slicing a lemon and rubbing it on the nails helps brighten and whiten them! 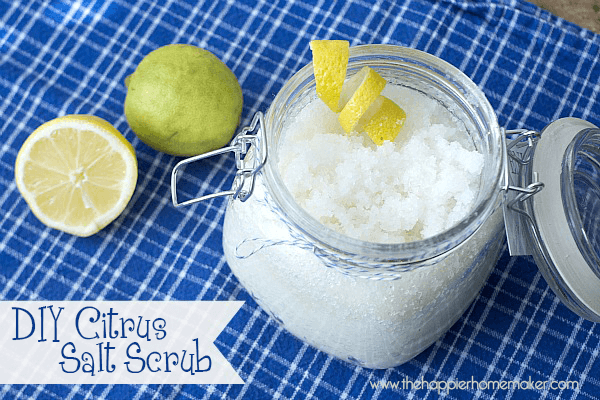 Lemon is wonderful for refreshing the skin-use the juice to create a citrus salt scrub as I describe in this tutorial. Add 1 tsp of lemon juice when cooking rice helps it to be nice and fluffy without stickiness every time! Many insects, including ants, hate lemon smells! Just spray your threshold with lemon juice to help keep them at bay. Starting the day with a tall glass of water and lemon juice helps detox your liver and is great for digestion! We’ve all been told to keep a box of baking soda in the fridge but lemon peels do the trick just as well! 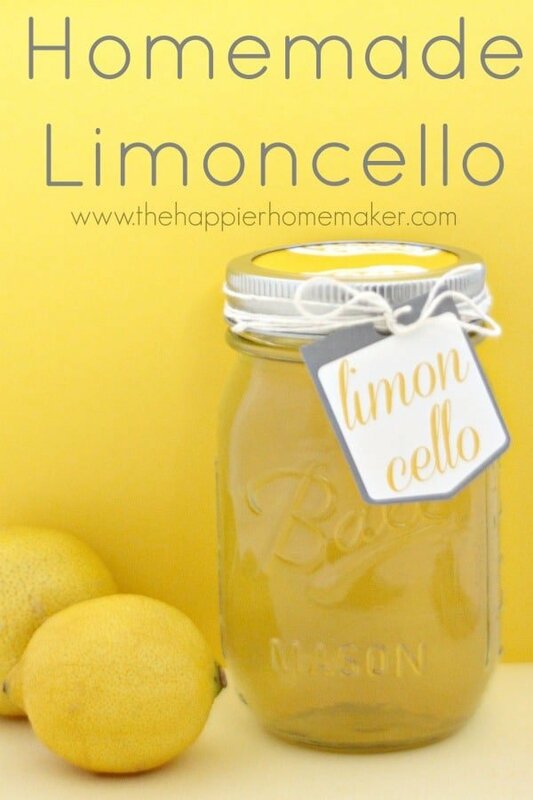 We fell in love with limoncello while living in Italy, make a DIY version with these instructions-it makes a great gift! Soak wilting lettuce in cold water with lemon juice in the fridge for an hour to help it regain it’s crispness! After cleaning, rub half a cut lemon over the surface of your cutting board to help further sanitize and reduce smells. I hate how quickly avocados brown-or guacamole as well. Sprinkle liberally with lemon juice to stop the oxidation that causes browning! We run humidifiers most of the winter and after a while they can smell musty-adding a few tablespoons of lemon juice to the water helps cut the odor and sanitize the machine. I’ve come to the age where I can see the bad judgement of extended beach days as a teen starting to show up in the form of age spots. Dabbing on some lemon juice and leaving it for 15 minutes before washing off can help lighten dark spots! Make a paste of lemon juice and baking soda and massage into dry areas of skin to soften and exfoliate. What are your favorite uses for lemons-I’d love to hear from you in the comments! This is an awesome list! I didn’t know so many of these things. I have used lemons for green cleaning applications, but in rice, or for my skin would be a new thing. Cool! i like to add 1 teaspoon of fresh lemon rind to my fairy cakes. It makes them taste great and the tops go all sticky when they are done! I use lemons as a stain remover on white clothes. I cut the lemon, squeeze the juice on the stain(s) and rub the lemon on it as well. Set the stained clothes outside and let it sit in the sun for a few hours, then wash it in the washer. For stubborn stains, add a little baking soda with the lemon juice and scrub with a soft toothbrush. Depending on how bad the stain is, you may need to repeat until satisfied. Thank you for sharing these helpful uses of lemon! I am a big fan of lemon juice! It is very surprising that I can use lemon juice for stop avocado from becoming brown! Great job! Did you know they can be frozen? I use lemons a lot and buy them by the bag at the 99 Cent Store. I toss the whole bag in the freezer and take them out as needed. To thaw, just run under cold water if needed right away or just set it out to thaw for later use. The flavor is not changed but the skin is softer. I’ve never tried that Pamela-I’ll give it a try! If I have a surplus of lemons I juice some and freeze the juice in inexpensive dollar store ice cube trays . I keep the cubes in a freezer bag to use in recipes and my hot water detox drink.